Doug Chiang is the design director for the Star Wars prequel. Robota is a personal project inspired by sketches of robots he drew when he was a kid. This is more of a picture book than an art book. Orson Scott Card filled in the role as the writer for the story. 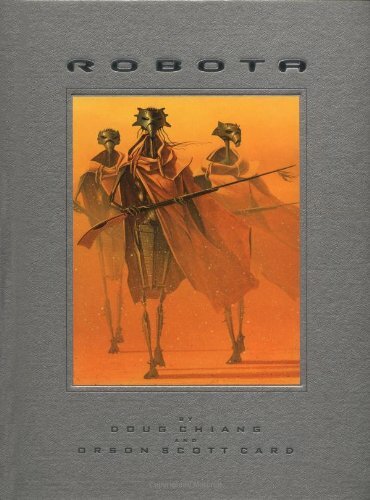 The story's about the battle between robots and humans on a world called Robota. In this world, humans were made slaves to the robots. One day, a mysterious young man appeared and started a revolution against the robots. That's the premise of the story. I've seen lots of concept paintings done by Doug Chiang on Star Wars. While the paintings inside this book are impressive, they are lacking in the story element. Except for a few, there's rarely any action in the panels. They are merely concept art. Nothing wrong with that except that there's a story going along. There's no communication between any characters. Here's a video to help you decide whether or not to get the book.